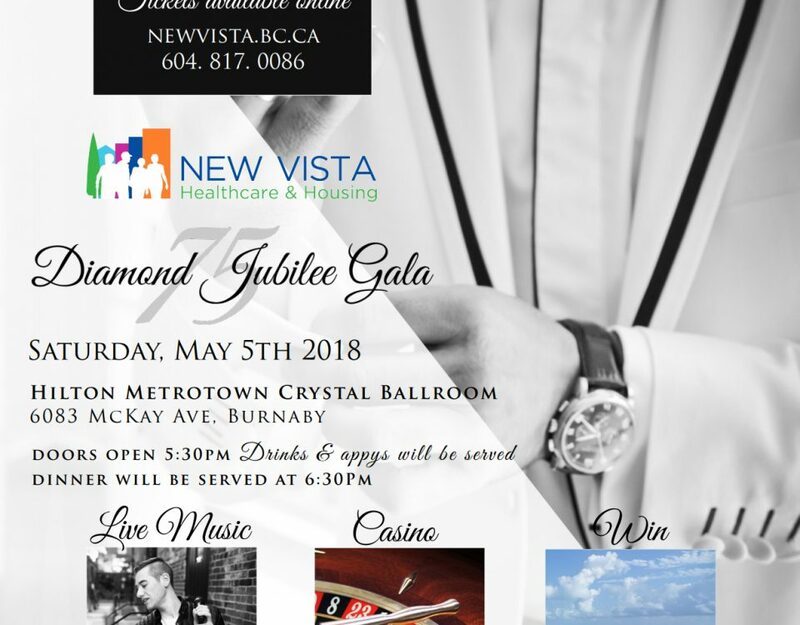 The New Vista Society is a registered, non-profit, charitable organization that was founded in 1943 by Ernest Winch, a Burnaby MLA who served from 1933 to 1957. 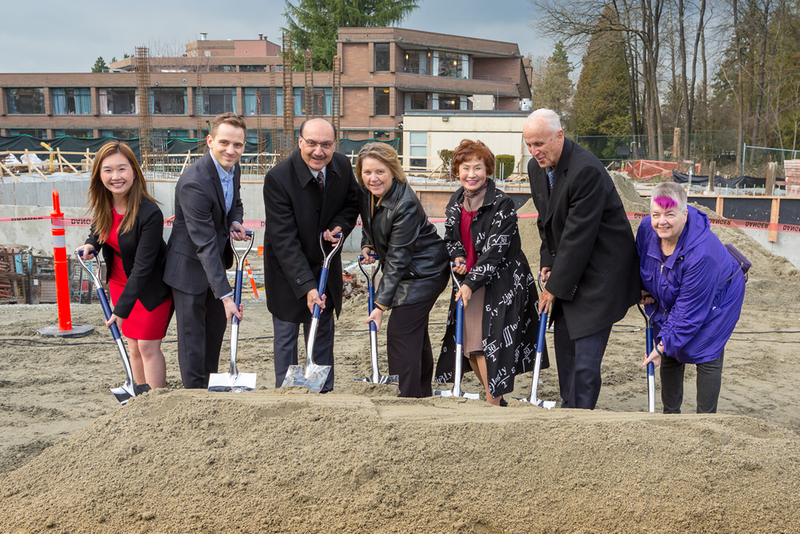 Initially formed to provide housing for women convalescing from psychiatric care, the New Vista Society has evolved as the governing body that oversees our social housing facilities for low to moderate income families in south Burnaby and residential care for an increasingly frail seniors population. New Vista Society’s membership is made up of interested Burnaby residents and community volunteers. Donate Now | 지금 후원해 주세요. Legacy Giving | 유산을 남기다. 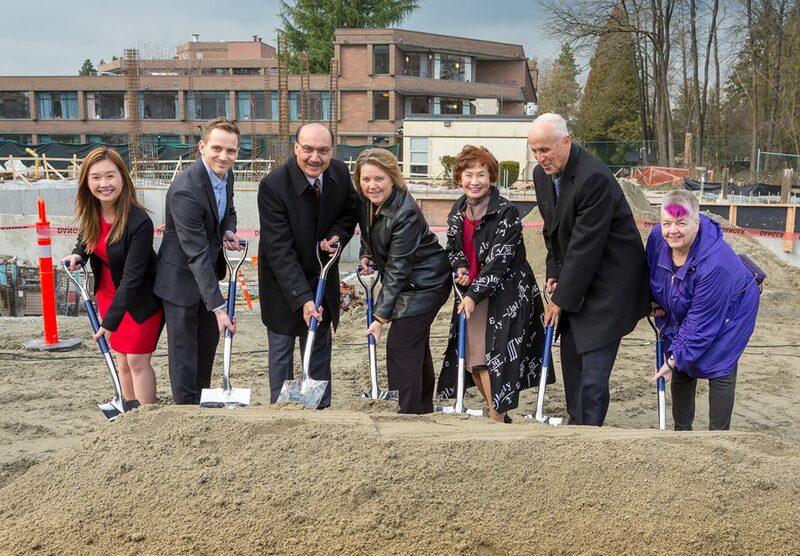 The New Vista Society along with Raj Chouhan - MLA for Burnaby-Edmonds, Councillor Paul McDonell - City of Burnaby, Curtis Snider - Manager, Planning & Development, Residential Services and Contracts, Fraser Health Authority officially broke ground for their new care home to provide 240 residential care beds and replace their existing facility in Burnaby. Seniors in residential care in Burnaby are going to get more help with day-to-day activities thanks to a nearly $4 million increase in care-aide funding for local care homes this year. 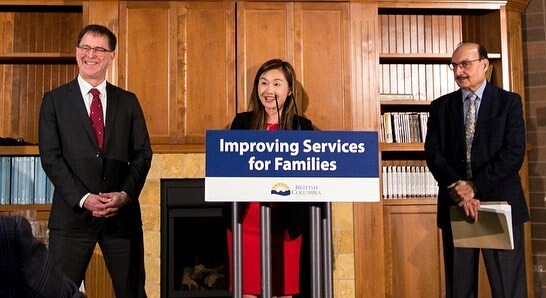 Health Minister Adrian Dix and Burnaby-Deer Lake MLA Anne Kang, the parliamentary secretary for seniors, were at New Vista care home in Burnaby Tuesday morning to announce the funding. Burnaby’s New Vista Society is one of 88 care homes across British Columbia to receive funding to purchase new safety equipment, as part of the Seniors Safety and Quality Improvement Program (or SSQIP, pronounced “SKWIP”) initiative. 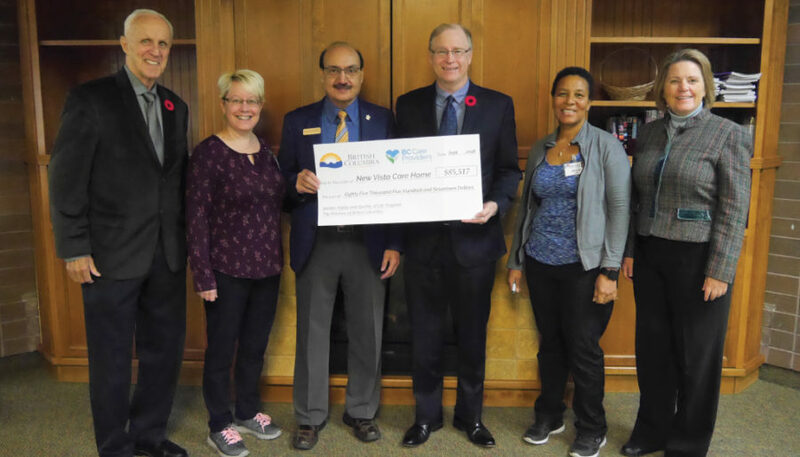 New Vista Society received $85,517 of the total $2.6 million in provincial funding announced by Minister of Health Adrian Dix during an August 10 event in Vancouver. 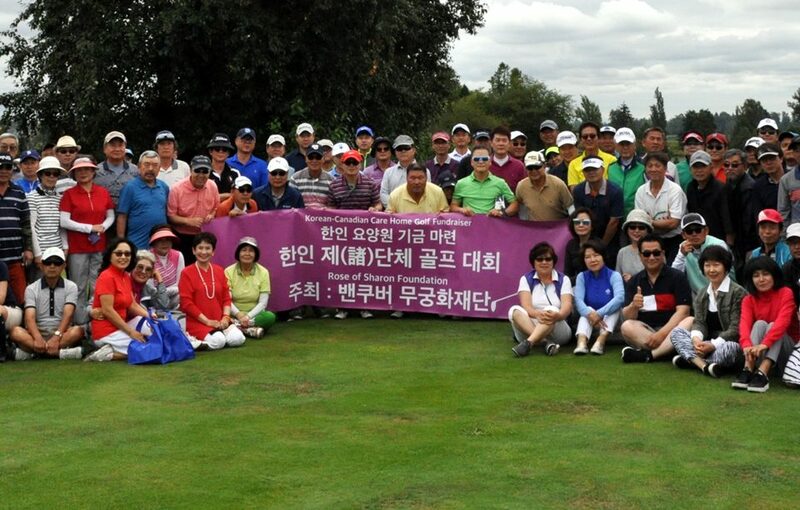 The New Vista Society would like to thank Eunice Oh, the Rose of Sharon Foundation and the Korean Canadian community for an amazing golf tournament resulting in a $25K donation toward equipment for our new Care Home. 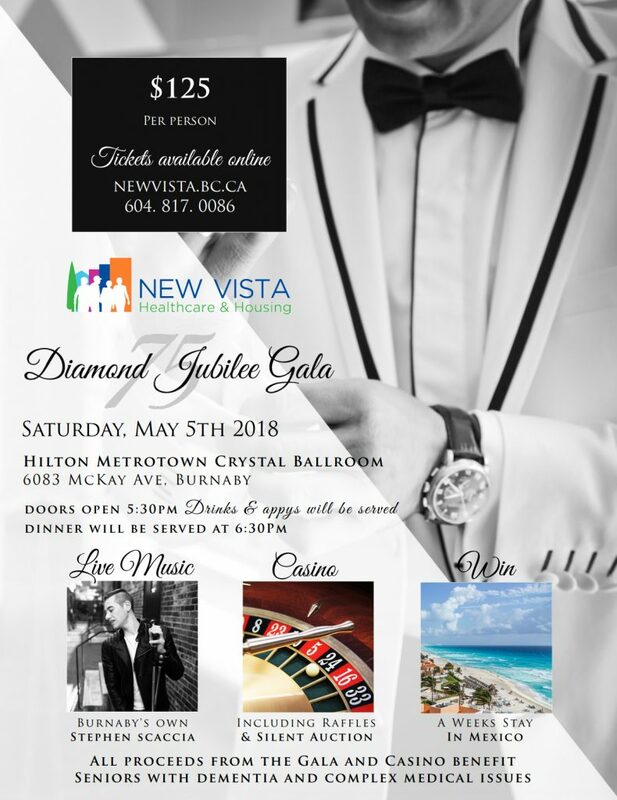 Please join us in celebrating 75 years of service at the Hilton Metrotown on May 5, 2018 for our Diamond Jubilee gala. There will be live music, casino games, raffles, and trip to Mexico up for grabs! All proceeds from the event will be donated towards our non-profit organization. 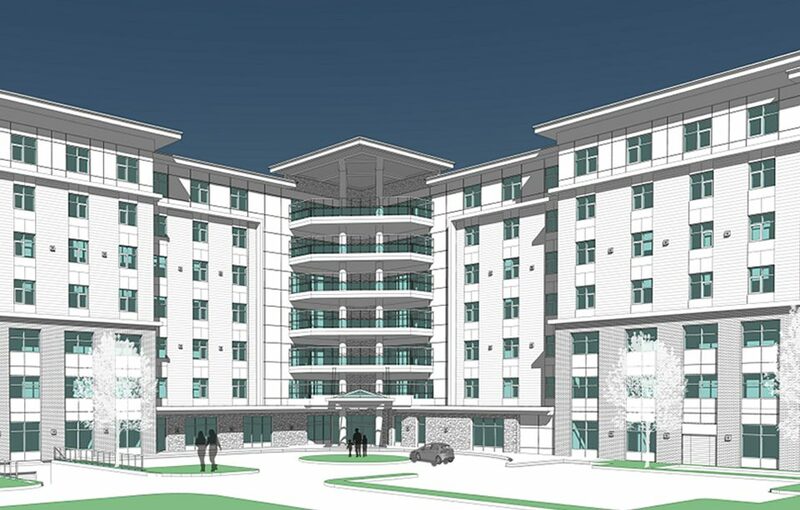 Burnaby will soon have a brand new residential care home, that focuses on the needs and cultural sensitivities of Korean Canadian seniors. The announcement was made today, along with the donation of a cheque for $1,500,000 from a generous donor, Ms. Eunice Oh, and the Rose of Sharon Foundation, both long-time supporters of the Korean Canadian community in BC. The New Vista Society's mission is to ensure a progressive organization that enriches the lives of residents, families and the community by providing care, support, and housing. Seniors and low-income people will have access to high-quality health care and housing services in our communities. Respect, trust, acceptance, safety, accountability, belonging.